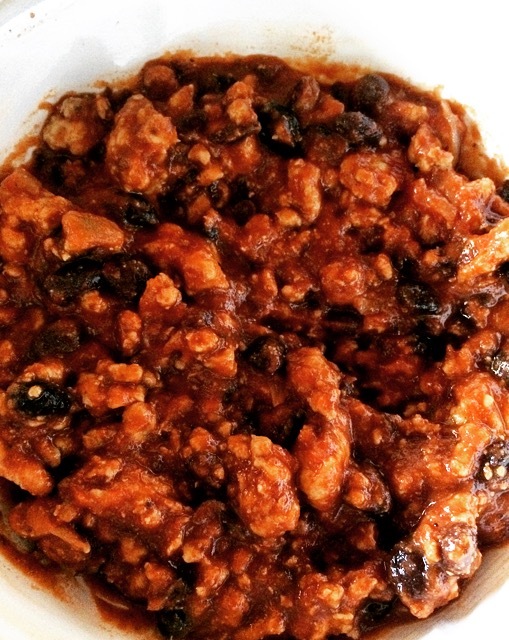 It’s getting a little chilly outside now… so what sounds better than chili??? It’s simple, quick and easy to make… and with basically one pot used, it’s an easy clean up. Don’t be afraid of the habanero. If you use one, it doesn’t actually make the chili that hot, but it adds a lot of great flavor. Admittedly, for a long time making chili to me was using one of those McCormick packets you can buy at the grocery store. But really it’s just as easy to make on your own… and adapt adding any flavors you like! Take a large pot, add a little olive oil and heat. Add the onions and cook until they begin to caramelize. Add the ground turkey. Season with salt & pepper. Cook until browned. Add the tomato sauce and tomato paste. Pour out 1/3 of the liquid in the black beans and add them to the pot. Add the chili powder & habanero (add 1 if you like your chili a little more mild, 2 if you want a little more heat). (add some chipotle powder if you want a smokey taste). Add salt, pepper and garlic to taste. Simmer for at least an hour. The biggest thing I learned is to continue to taste and adjust. A lot of the measurements are approximations, so just keep tasting. I love breakfast, I love a runny egg and I love eggs benedict. I wanted to find a way to make recipe that was as satisfying, but offered something a little different. It combines eggs, spinach turkey bacon The cakes have jalapenos in them, so it has a little heat. Although if you don’t like jalapenos, just take them out. 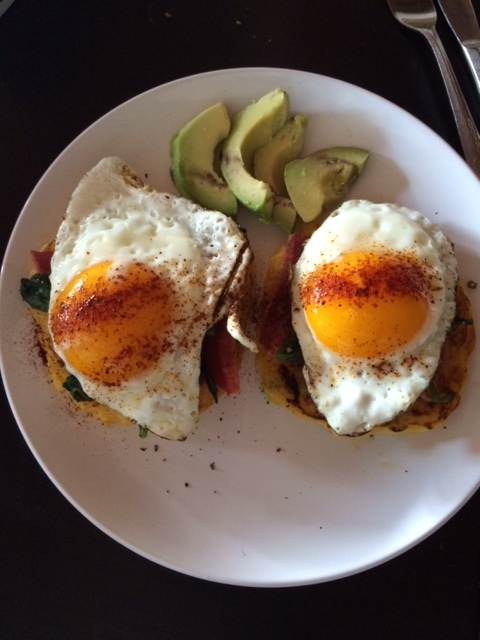 And if you’re not a fan of runny eggs… just make a fried egg and put it on top. (if you’re a Hollandaise fan, I apologize I left it out this time to make it a little healthier.) The corn cakes are really griddle cakes, and are not fluffy like a pancake. But they’re very satisfying… just know that that intention is for the cake to be more dense. It definitely makes it a heartier dish. A couple things to note before we begin the recipe. First, The recipe will make about 3 corn cakes. the calorie count and recipe only accounts for two. Just like pancakes… you always want to leave a little extra batter in case the first one doesn’t come out. Second, you won’t need a TON of butternut squash. Unless you plan on eating a lot of butternut squash in your future, I suggest buying frozen or already chopped butternut squash. To have to break down an entire butternut squash and cook it just for these corn cakes seems excessive… but hey if you’re up for the challenge… go for it! 1 cup butternut squash cubes (cooked… at least to the point where a fork can easily poke though the cubes. Here we go. In a bowl add the salt, baking powder, garlic powder, onion powder, cornmeal. Mix together well. In a separate bowl, mash the butternut squash to the best of your ability. Add the milk and egg whites. Mix together. Add the wet mixture to the dry mixture. stir until smooth. (will be a little gritty looking because of the cornmeal.) fold in the jalapenos. Heat up a skillet sprayed with olive oil or cooking spray. make two medium-sized cakes (You should have leftover batter. This is just as a buffer. Feel free to use how you please. But you should have just enough batter to make three.) Cook over medium heat until the bottom is brown. Flip until the other side is brown and cakes are done. remove from heat. In a separate pan, throw the spinach in a pan along with salt, pepper and a tablespoon of water. Cook until water has burned off and the spinach is cooked/slightly wilted. Remove from heat. Spray another pan with non-stick spray (olive-oil). Cook two pieces of turkey bacon in a skillet, along with two eggs. 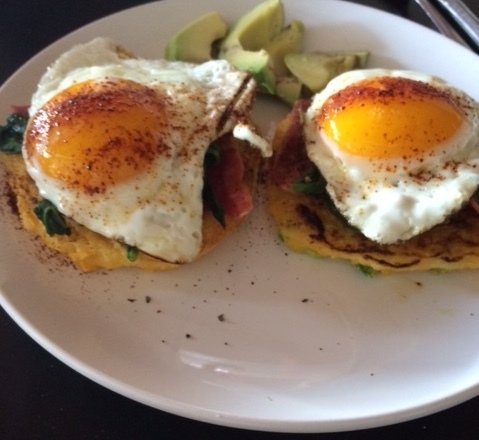 Eggs should be sunny side up (fried on the bottom, but egg yolks still runny. When both the eggs and bacon are done, remove from heat. On a plate, put down two of the corn cakes. Top each one with a slice of turkey bacon (cut in half or thirds so it has a nice bed of turkey bacon, and it’s not just one long strip), the spinach and finally the egg. Top the egg with a dash of salt, pepper and chili powder. Goes great with a side of avocado. The big problem with turkey burgers is they dry out easily. But if you can make it juicy, it’s delicious. 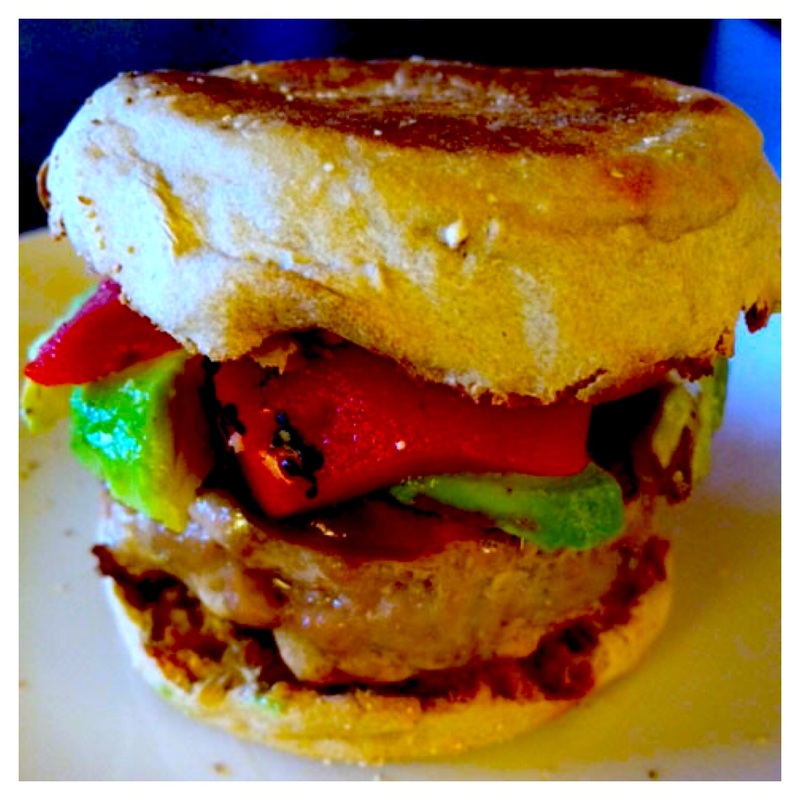 In this burger recipe, I use a toasted english muffin as a bun. It’s crispy, and can handle juice well without getting soggy. Also check out my Garlic Rosemary French Fries Recipe for a great side! *really only need a couple of dashes of each. -Whole wheat english muffin (I used Thomas’ Light english muffins which are 100 calories a muffin. Chop up the red peppers and avocado. When you’re patty is done assemble it! Add the balsamic ketchup if you have it. Easy and quick recipe!